As memorable dining experiences go, sitting inside a giant red Christmas tree bauble under a crystal chandelier – a jazzed up version of Jingle Bells trumpeting away in the background – has permanent place in the brain bank. By the time this goes to press, said bauble banquet spot will have already been rolled away for the season, to return with the snow, glühwein bars and stalls selling maniacal nutcracker trinkets next winter. Elsewhere in the temporal lobe, running down the freshly powdered San Viglio mountain in snowshoes; a stark naked encounter with a sexagenarian male masseuse (no, there won’t be more on that later…); imbibing a pizza that tasted every bit like a margarita, but looked anything but; and catching snowflakes on my face whilst lying enveloped in bubbles in an outdoor whirlpool, have all been stored away under ‘things I’ll never forget’. 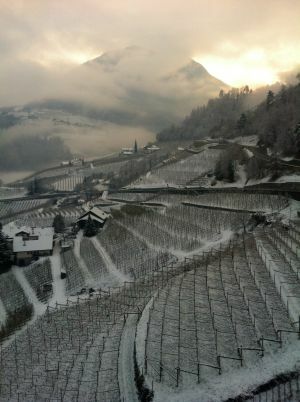 Ah, South Tyrol. Your deliciousness did not come as a surprise, but it was a surprising level of deliciousness all the same. As the hoards prepared to don their salopettes for a getaway spent relentlessly descending the slopes, our girly group had an alternative plan for a winter visit to the region – largely centred on sampling the spas and Michelin stars. With so much food and so little in the way of exercising, snowshoe walking aside, we enjoyed all the fun of a ski holiday, without the actual skiing. The way forward, I’ve decided. Après-ski is the best bit anyway. I’ll take fondue over falling over face first from a Poma lift; being slathered in a pine-scented scrub, over scrambling out from a snow-disguised shrub; getting high on warm spicy mulled wine over heading off piste, every time. “Prost” and “salute” are both as likely to be said in the celebratory clinking of glasses at the dinner table, while similarly it’s not unusual to see the likes of schnitzel and lasagne grace the same menu. 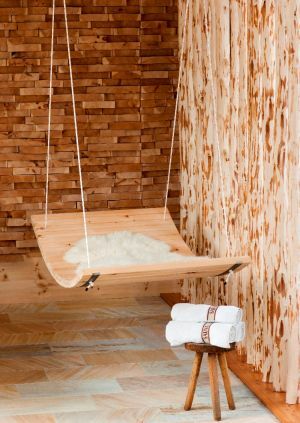 With an affinity for ‘baths’ stretching back to the Middle Ages, saunas (pretty much all strictly naked, we discovered through trial and mostly error) and spas, the South Tyrolean lifestyle is good for the mind, body and soul. Not so good for the waistline or general self control, but while in Rome and all that – although to be fair, the people do look as if they spend a good proportion of their time skiing, hiking, swimming and yoga-ing to offset any indulgence. This particular body was massaged, scrubbed, wrapped in hay and all manner of fauna by day, and filled up with all manner of gastronomic delights by night; dawn and dusk too, to be honest. 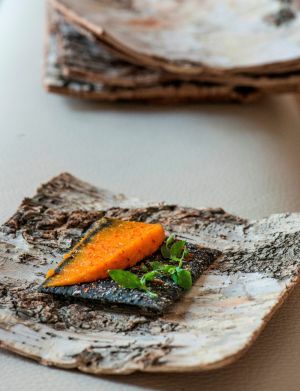 Mountain cheeses that range from delicate and chalky to downright stinky and apples in abundance and served as so, on restaurant and spa menus alike, are among the championed local bites. The wheat and gluten intolerant should avoid South Tyrol all together, or eat in-room, for the bread here – from the white twists rolled in butter and then baked to golden brown to the crispy farmers’ ‘Shaking Bread’, and skinny sticks infused with various herbs and flavours, is to die for. The accompanying butters too – mixed with berries, wild herbs, goat milk and other seasonal flavours. The unfortunately named, but very tasty, speck featured heavily; a generous chunk bought from a Merano market stall followed me home in my suitcase too, subsequently chopped into pork and apple hotpots, diced thinly and added to scrambled eggs and nibbled at with crackers and cheese. There is much for your mouth to fall in love with here. At the top-end of the dining list sits Auener Hof, referred to as the highest Michelin star restaurant in Italy. A statement that confused me until I realised it was due to its 1,622m high mountain location, rather than a Michelin ranking system I’d never heard of. They flirted with us on arrival, serving South Tyrolean rosé and various arty appetisers in the cosy, fireside white leather surroundings, before leading us through to the main restaurant. A soft regional red, I was too focused on the spindly elderflower and beetroot bread sticks to note, flowed gently, mingling rather nicely with the four course tasting menu (6, 8 and 12 variants are also available). Rich, eye-closing, mmm-inducing elements of black truffle raviolone; tender beef cheek, parsley root and vanilla oil; Mascao chocolate, saffron cream, quince ice cream and liquorice – a dubious combination on paper, but a dream to look at and scrape away to nothing – danced around my mouth, while across the table my friend tucked in to three courses of a la carte, including a glazed suckling pig which she displayed so much joy for it would have been cruel to accept her offer of a sample. A return visit to Auener Hof would have to be combined with a stay in one of their 10 four-star rooms and an afternoon in their cutch of a spa with its 300 degree views of the mountains. Further down the mountain in the spa town of Merano, is the equally impressive and Michelin-graced Sissi, the homely 11-table outpost of chef Andrea Fenoglio. A place where culinary magic happens: aside from the aforementioned liquid pizza, smoked mackerel – brilliantly presented under a dome of smoke which when lifted omitted a smell so good I could’ve dined on that alone – and crispy celeriac ‘fake fries’, every dish surprised, delighted and entertained. A bit like the man himself: charming and attentive with a soft Italian lilt made for bedtime storytelling. The understated, simply decorated space feels a bit like Fenoglio is hosting you in his own home, which pretty much sums up the warm welcome, service and so long received. A fun, not at all financially-taxing must-book. Other memorable tastes of South Tyrol were served up 8 kilometres away at the Vigilius Mountain Resort, the base for our snowshoeing jaunt and the winter wonderland whirlpool experience. The hotel itself, a 12-year-old, five-star eco-friendly property built on the traffic-free Vigiljoch Mountain, is accessed only by cable car – a 1,500m ascent which takes in photogenic views of the vineyard and apple tree-lined Adige Valley. It’s gallery-like in design with clean, wide open spaces and long corridors – set scouts for a remake of The Shining should head here – graced with quirky furniture and art in the form of punchy wooden sculptures carved by Japanese artist Hideki Linuma, oversized lampshades and gargantuan windows looking out onto the Dolomites. It’s a quiet, soothing place, somewhere to forget your woes and restore the senses with a Five Tibetans yoga class or hike in the snow or summer flower-adorned mountain trials; curl up next to the fire in the rich plum and brown ‘piazza’ with a lengthy read; spend afternoons soaking up the spring water swim and sleek spa offerings and leisurely eves dining and drinking up the local delights. The modern carries into the bedrooms, where chocolate truffles greet you, baths are deep and angled towards the Alps, and the muted, earthy tones deliver a restful snooze. In contrast to the contemporary architecture which makes up most of the hotel, the main restaurant, 1500 – where a hearty breakfast spread and the best cappuccino I’ve sampled in Italy was served – is decked out in wooden beams and floorboards and triple aspect windows which look out on to a magnetic pine and mountain-filled scenery. 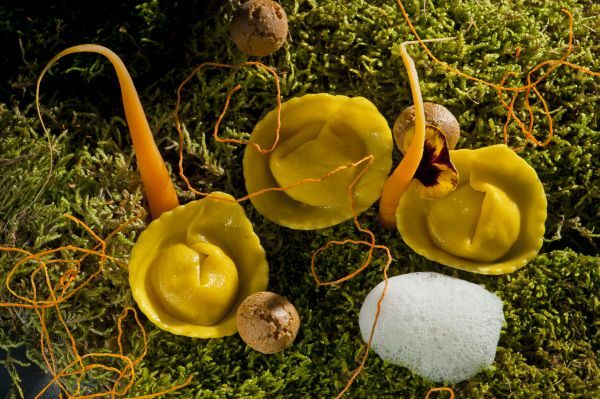 Chef Mauro Buffo, whose culinary CV boasts periods at the three Michelin Le Calandre and Ferran Adria’s El Bulli, serves up a menu of modern and creative Italian cuisine – his outstanding smoked ricotta and apricot stuffed tortellacci will forever reside fondly in my memory. On the other end of the design scale is Val Sarentino’s Bad Schörgau, where we arrived to witness a family cheerily putting the finishing touches to a snowman, while the youngest member chewed contently on its carrot nose-to-be. A scene that echoed the family-run, homely feel of the hotel, where every nook and cranny is graced with a painting, wooden sculpture or various other curios, including an impressive collection of empty wine bottles, from piccolos to jeroboams. Bedrooms, with their soft dove grey and white furnishings, silk stuffed, sinkable duvets, and abundance of wood, are the epitome of ‘chalet chic’. Bad Schörgau’s piece de resistance, though, is its wellness offerings. On a par with the exuberance of Vigilius’, but all the more delicious; particularly at night when the steam rises off the illuminated outdoor pool of beckoning azure waters and inside, a maze of little rooms serve up a menu of various traditional baths. 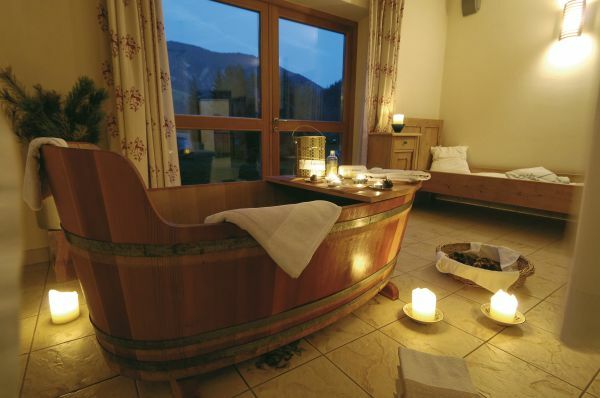 If you only indulge in one South Tyrolean pastime, make it one of these baths. I kicked off one of many at the first night’s hotel, The Platitscherhof Residence, where I sampled the popular hay. A treatment like no other I’ve experienced, which involved stripping off and laying on a floating canopy, enveloped in padded layers of hay, herbs and other restorative mountain gatherings (I spotted a feather or two in there too) – like chains of giant chamomile teabags. Steam was periodically pumped from below up to a maximum of 44 degrees for 20 minutes, while eyes closed, I focused on deep breathing (read: trying not to pass out in the heat) and inhaling the scents, as sweat formed and dripped inside the cocoon and a deep calm ensued. It claims to boost circulation, detox, soften skin and aid aching joints, and there’s no doubt I was left feeling pretty incredible after. It felt good: healing and even though I suffer terribly with hayfever, not at all irritating; like my body was stoned, but my head, clear and calm. Other ‘baths’ served up throughout the region include wine, chestnut, sheep wool, grapes and whey and a treatment using the glacial ice from the Alps, as well as scrubs ranging from dwarf pine needles to apples. The thermal baths in the aforementioned Merano, a town long-renowned for its spa offerings, previously frequented by many a literary great, artist and member of the European nobility in search of rejuvenation, is a recommended stop off for some further preening. 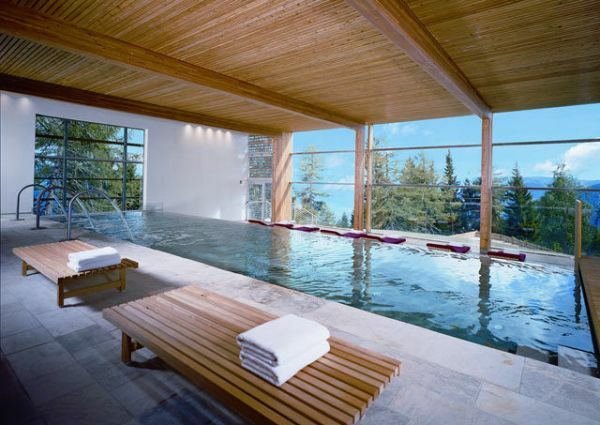 Boasting 15 indoor and outdoor pools and a handful of various saunas from Finnish to steam and a snow room with actual snow to crunch under brave, we effortlessly lost a morning there. 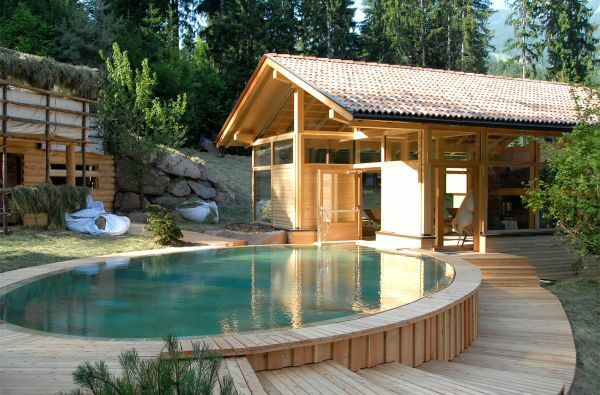 First being pampered with a South Tyrolean mountain peel, then working our way from one area to another, back and forth; the contrasting 2.5 degree external air a lovely breath of freshness for the mind as the body enjoyed the comforting envelope of the 34 degree outdoor hot pool. An 18 degree cold pool marked out the brave, who in this case was an elderly lady with the joie de vivre marked out on her glowing wrinkled face. She put us all to shame, lapping around for far more minutes than can be physically safe. Lunch across the square in the Christmas bauble followed, after which, a perusal of the markets, then more spa, dinner, sleep, breakfast, spa… Needless to say, after four days of this constant rotation of mental, physical and edible indulgence, returning to real life – quite a few pounds heavier – was a blues-filled chore indeed. 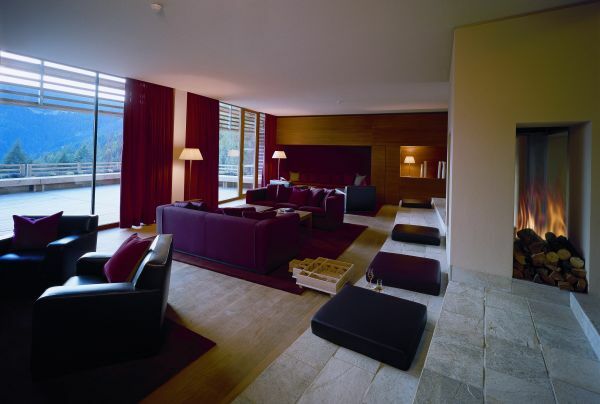 For more information on South Tyrol, visit the website. The Plantitscherhof Residence, Dantestr 56, I-39012 Meran. Website. Vigilius Mountain Resort, Vigiljoch Mountain, I-39011 Lana. Website. Bad Schörgau, I-39058 Sarntal. Website.